Scoopon, Cudo, Our Deal and Catch of the Day are all the rage here in Australia – and what exactly are they one might ask? Well it works something like this. These website offer an item or a service at a special price, often more than 50% discount and if enough of us buyers shows an interest the “deal is on”. We have to buy it there and then and have a certain amount of time to use it usually 6 weeks up to one year depending on the fine print. Yes do remember to read the fine print!!! So this little black chook, yes moi, have been buying up a storm lately of these vouchers, they represent very good value for money. Who can say no to a dinner for 2, entree, main course, dessert and a bottle of wine at a lovely restaurant valued at $150 and only pay half of that or less. Or perhaps a haircut, style and color with a massage and manicure thrown in with a glass of champagne and what about a round of golf with a couple of beers or fancy a spot of bowling for a family of four perhaps? 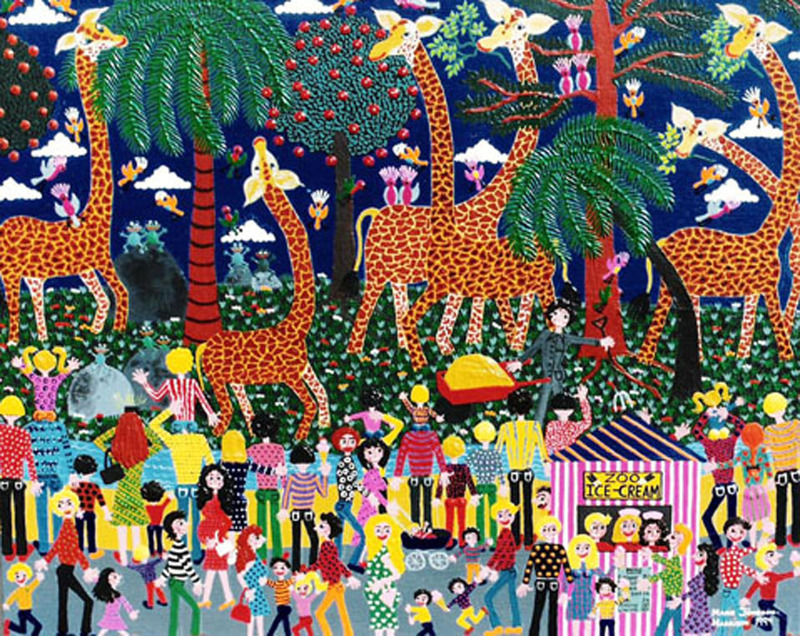 Maybe a day at the zoo for the whole family with lunch, is more to your liking, as this acrylic painting which sold in Japan depicts. I have been purchasing these deals both for ourselves as well as for gifts to family and friends and so far we had been very happy with our experiences. That was until last night that is, lol. It was my husband’s birthday yesterday so a lovely meal was in order and as I had previously bought a voucher with a Lebanese banquet for six, we thought this would be the perfect opportunity to use it. We vaguely knew the name of the place but that was years ago and at that stage it was only a take away place. So the fact that they had now added a restaurant sounded good. As we are an adventurous family and like new experiences we thought we couldn’t go too wrong. WRONG! There were 5 of us in our car and our sons lovely girlfriend drove herself there a bit earlier as she had made a surprise pavlova (cake) for the birthday boy. She went in and asked to put it in their fridge and then waited for us in the car park. Poor sweetheart, her eyes were big as saucers by the time we arrived, well so were all of our eyes actually by the time we met up. You see as we finally got to our destination and found the place we could not believe our eyes – this was still a “take-away joint”, although to give them credit it had undergone a major revamp. It was now stark and white with a big food counter and a couple of drink fridges, bright neon lights, like a hospital would use and a blinking open sign on the window. We saw a few customers standing around waiting for their order and some kids running around playing. They had a total of 3 tables and 2 of those were pushed together in between the counter and the window to fit the birthday party! Bryan and I were sitting in the car too stunned to speak, luckily our daughter made the call – she said: “There is no way that we are going to have dads birthday dinner in there”, and with that we all burst out in hysterical laughter till we had tears running down our cheeks. Then everyone pointed the finger at me of course and said I was banned from buying any more of these you beaut deals on the net!! Mmm… how quickly they all forget all the other good ones we had gotten, lol but in this case they were right. So off we went to another establishment known to all of us and a lovely night was had by all. So in the end it certainly was not a cheap night as in fact we paid for two dinners and one that we will probably never use. To add insult to injury today I wasted another deal as I forgot to pick the item up when I was in the vicinity and the petrol and time to turn around and go back wasn’t worth it. So lesson to self – ease up on the deals Marie! “Credit buying is much like being drunk. The buzz happens immediately and gives you a lift… The hangover comes the day after.